Located 52 kms south west of the capital city of Srinagar Gulmarg lies close to the Indo-Pakistan border area. 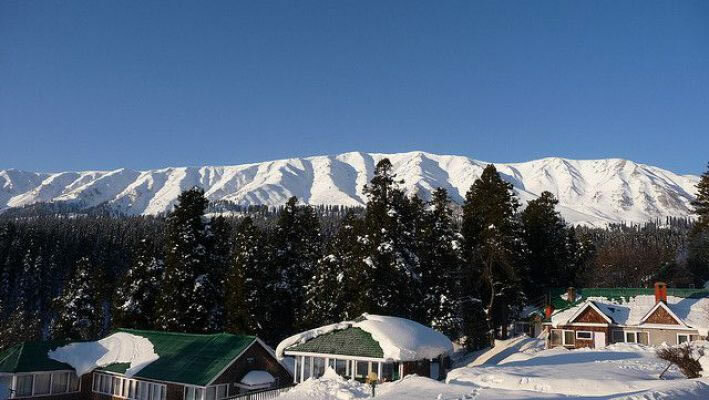 Immensely beautiful, the landscape of Gulmarg offers a pleasant and comfortable stay to its visitors. Today the place. has been famous for the different adventure activities and gives a fabulous background to many bollywood movies. The original name of Gulmarg was gaurimarg. Its name has been changed by Yousuf Shah Chak after collecting 21 kinds of flowers.Gulmarg, "Meadow ofFlowers", was discovered in 16th century during the reign of Sultan Yousuf Shah. Historians describe the famous love couples, Habba Khatoon, poetess of Kashmir and King Yousuf Shah Chak, and Jehangir and Noor Jehan visiting Gulmarg for enjoying life. Gulmarg is on full bloom during the Summer with flowers like bluebells and daisies. This wonderland of nature was first discovered in the year 1927 by the Britishers as a place of recreation and relaxation amidst the glory of nature during pre independence India. Gulmarg is having the best ski resort in the country. The place maintains the standards naturally friendly service for which Kashmir is famed. It has been identified european skiing resort in the past. It holds a position as one of the highest lift served ski resorts in the world. Kashmir is also one of world's best heli skiing regions with thousands of possible 2200 meter descents. Gulmarg hosts several national winter games championships and recently in 2008. The slopes provide excellent opportunities to cross country and downhill skiing events. The resort has modern infrastructure helps in keeping the slopes fit for skiing and other winter sports related activities all times.